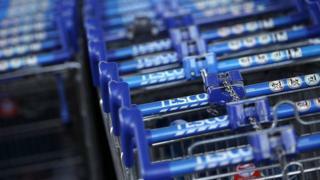 Shopping trolleys at Tesco's biggest supermarkets will be left unlocked when the new £1 coin is released on Tuesday. The company said it was an "interim" measure while it carries out work to replace the locks on its trolleys to take the new 12-sided coins. Fewer than 200 of Tesco's 3,500 UK stores have trolleys which need a coin or keyring token to use them. Asda, Morrisons and Sainsbury's have said their trolleys accept both the old coins and tokens and the new ones. Tesco said in a statement: "We're replacing the locks on our trolleys to accept old and new pound coins as well as existing trolley tokens. There would be "colleagues on hand to attend trolleys in our stores, so our customers aren't affected by the changes", it added. Staff would also make sure the trolleys were returned to the trolley park, a spokesman told the BBC. Only trolleys in Tesco's largest stores need coins or tokens to access them. After the new £1 coin comes into circulation on 28 March there will be a six-month transition period during which both the old and the new coins will be accepted as legal tender. The old round coin is to be completely phased out by 15 October. New £1 coin: What do you need to know about the end of the round pound?